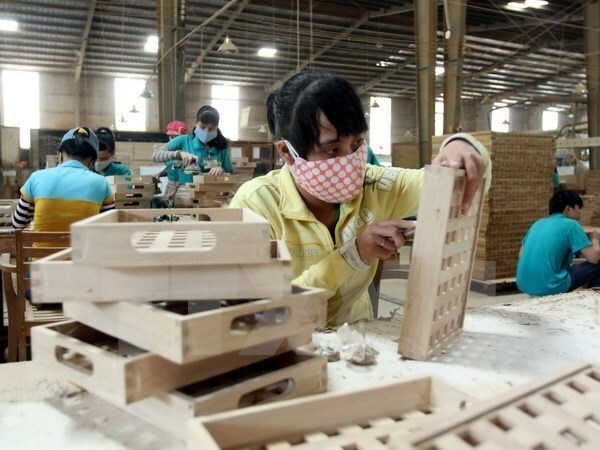 Hanoi (VNS/VNA) - Improved exports in March helped Vietnam gain a trade surplus of 536 million USD in the first quarter after running deficits in the first two months, the latest update from the General Statistics Office (GSO) revealed. Statistics showed that exports reached 22.4 billion USD in March, representing a rise of 61.1 percent over the previous month. This helped Vietnam return to a trade surplus after running a deficit of 800 million USD in January and 84 million USD in February. Still, the surplus of 536 million USD was much lower than the 2.8 billion USD recorded in the first quarter of 2018. The domestic sector reported a trade deficit of 7.04 billion USD in the period, while foreign-invested firms posted a trade surplus of 7.57 billion USD. January-March exports totalled more than 58.5 billion USD, up 4.7 percent. Exports from the foreign investment sector (including crude oil) were worth 41.5 billion USD, contributing nearly 71 percent of the country’s total export value. The quarter saw nine products with export value of more than 1 billion USD which altogether accounted for 70.8 percent of total export value. Exports of garments and textiles were estimated at 7.3 billion USD (up 7.3 percent), electronics, computers and parts 6.9 billion USD (up 9.3 percent), footwear products 4 billion USD (up 15.3 percent), equipment and parts 3.9 billion USD (up 5.2 percent) and wood products 2.3 billion USD (up 17 percent). Phone and components posted the highest export value, worth 12.1 billion USD, but dropping by 4.3 percent over the same period last year. Seafood exports decreased by 1.4 percent to 1.4 billion USD while other major agricultural products also saws declines, such as fruit and vegetables (down 8.6 percent to 885 million USD), coffee (23.8 percent to 830 million USD), cashew nuts (17.2 percent to 625 million USD) and rice (23.6 percent to 567 million USD). The US remained Vietnam’s biggest export market, spending 13 billion USD, up by 26 percent, followed by the European Union with 10.2 billion USD, up by 2.5 percent, and China with 7.6 billion USD, down 7.4 percent. Vietnam spent 57.98 billion USD on importing goods in the first quarter, up 8.9 percent. Major import products were mainly equipment and materials for production, including electronic products, computers and components (worth 11.7 billion USD, up 12.2 percent), equipment (8.7 billion USD, up 15.1 percent) and fabric (2.8 billion USD, up 6.4 percent). China remained the largest import market during January-March with a value of 15 billion USD, an increase of 9.7 percent. The Republic of Korea came in second place by exporting 11.8 billion USD worth of goods to Vietnam, up 1.1 percent year-on-year, followed by ASEAN with 8.2 billion USD, up 10.1 percent.